The silver lining – they say every cloud has one, but when that cloud is migraine, it’s extremely difficult to see it! People cope with their migraine in different ways, some with painkillers, some with mindfulness, yoga or acupuncture and some like to express their pain and how migraine makes them feel in artistic ways. Some sufferers find a release of kinds in this type of thing. It’s like the technique used by many people when they write their troubles on piece of paper then burn it and watch it spiralling away, their troubles along with it. Of course this can’t be done for migraine, but it can be helpful. You’re confronting your pain, accepting it and telling it that you’re the artist, you will draw it, you’ll write it, you’re the one who’s in control! But she is asleep a lot. She says ‘I have a headache’. Going around with a compact on her head. I found the following picture in my desk when I first came to the Migraine Association of Ireland. It was done by a student and it represents their aura. I was so struck by it that I put it on the wall and it’s been there ever since. How do you think you could do artistically? 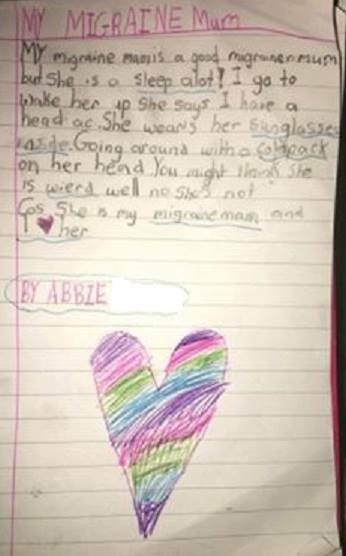 Could you write a poem like Abbie’s, could you compose a short story, or even a song? 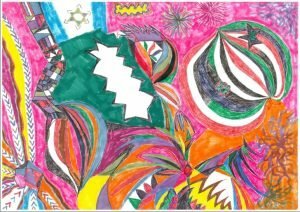 Could you draw or paint your migraine? Maybe give it a go and see if it helps you at all.